Washington Place has a distinctly nostalgic feel. The block between Washington Square East and Greene Street is probably the closest New York University comes to resembling a suburban college campus, with violet and white flags flying on both sides of the street, and the greenery of Washington Square Park as a backdrop. Many passersby are doubtless reminded of their own college days. But the block also hints at something older. The cobblestones that still pave Greene Street, and the architectural details of buildings saved by the Greenwich Village historic preservation movement, transport visitors back to the nineteenth century. Conveniently, this is when the story of 27 Washington Place begins. In 1842, Henry James, Sr. purchased a townhouse at 27 Washington Place. * The birth of his first child, William, on January 11th of that year may have inspired him to find a more permanent home for his family. However, James had rented in the neighborhood for several years. He occupied a bachelor’s apartment in the University Building on Washington Square East in 1838, and then—with his new wife, Mary Robertson Walsh—moved to 2 Washington Place. He knew firsthand that it was a good place for a well-to-do family to settle in New York City. The former potter’s field at Washington Square had been transformed into Washington Parade Ground, a military parade ground that also served as a public park, in 1828. Local residents strolled and children played there. “The Row” of Greek Revival-style homes recently built along Washington Square North was one of the most fashionable addresses in the city. Its wealthy residents included Mary’s family, in whose home Henry and Mary were wed in 1840. The closeness of 27 Washington Place to the studious atmosphere of the University Building may have also attracted Henry. (The two buildings were only separated by one house, 29 Washington Place.) He was a theologian who took his work quite seriously. Perhaps he had enjoyed the university’s community of scholars and intellectuals as a resident, and hoped to continue to participate in it as a neighbor. 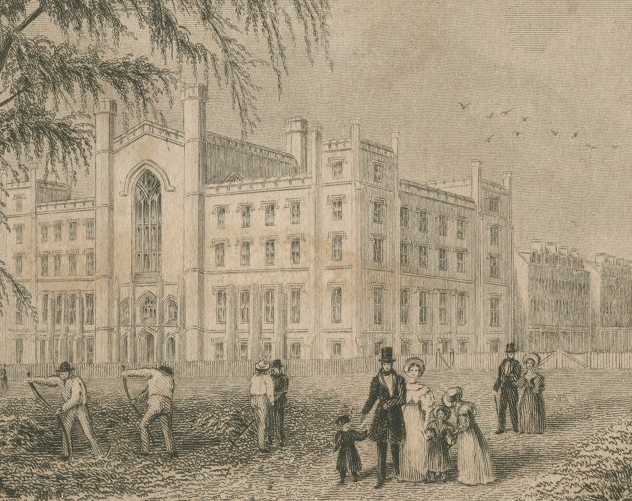 Detail from an engraving of the University Building by Robert Hinshelwood, with 27 Washington Place visible behind it. During Henry James’ decades in Europe, New York City expanded northward, and the neighborhood around Washington Square lost its suburban character. The wealthy and fashionable residents of the Row began to move away. Meanwhile, many of the immigrants who had fled famine, political and economic strife, and religious persecution in Europe constructed their own communities in neighboring areas of Greenwich Village. Residential buildings around Washington Square were demolished or transformed into commercial buildings in which workers toiled for long hours at low wages. Other buildings were subdivided into cramped tenement housing. Even the houses on the Row became multi-family dwellings in the 1880s. 27 Washington Place was not immune from this change. By 1894 Joseph J. Asch had acquired it, along with 23, 25, and 29 Washington Place. Asch demolished the houses in 1900, four years before Henry James’ return from Europe, to make way for a ten-story commercial building. When the Asch Building was complete, a pair of business partners named Max Blanck and Isaac Harris moved their factory to its eighth floor. As Henry James glared up at the building that had usurped his birthplace, hundreds of immigrant laborers sweated at the sewing machines of the Triangle Shirtwaist Company. The story of the fire at the Triangle factory has been told elsewhere. It deserves more attention than I can give it here, but in short, these are the facts. 146 people died in half an hour. They were mostly women, mostly Italian and Jewish immigrants, some as young as fourteen. 146 people who were trapped in a burning building by locked doors, a small elevator, a broken fire escape, and fire department ladders too short to reach the eighth floor. Some victims fell from the windows. Some jumped, rather than burn alive. It is incredible, almost insulting, that the Asch Building survived the fire when so many people did not. Yet it did. The upper floors were rebuilt, and the building was renamed the Greenwich Building. Frederick Brown acquired it shortly afterward. New York University began to rent classroom space in the building in 1916, and in 1929, the Brown family gave the building to the university as a gift. It is now called the Brown Building. New York University students attend classes there daily, in a world that shares little with those of either Henry James or the Triangle Shirtwaist Company employees, except its location. In The American Scene, Henry James bemoaned the lack of a physical historical marker at his birthplace to match the one imprinted in his memory. There is still no historical marker for Henry James on the Brown Building today. He is commemorated elsewhere. However, there are three historical markers on the Brown Building at the corner of Washington Place and Greene Street, remembering the victims of the Triangle factory fire. It is a small oversight, perhaps, but Henry James was one man who lived a full life of privilege and fame. They were 146, poor and otherwise unknown. How many times in history has the reverse occurred? 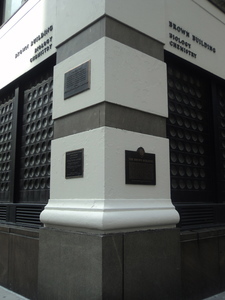 The historical markers on the Brown Building. Photo by Harmony Barker. The history of 27 Washington Place serves as a case study in the changing character of Washington Square throughout the nineteenth and twentieth centuries. More than that, it serves as a reminder that, especially in places where space is limited and populations are dense, history marches on. Henry James might have wished for the Washington Square in his memory to remain unchanged forever, a monument to the great writer and his great works. Likewise, a witness to the fire at the Triangle Shirtwaist Company might have wondered how the site of such horror could ever become anything else. But the story of Washington Square, both joyful and tragic, continues to grow and change. *The house was actually numbered 21 Washington Place when Henry James, Sr. purchased it in 1842, but the street was renumbered two years later. For the sake of clarity, I have referred to the James house as 27 Washington Place throughout this post. Thomas J. Frusciano and Marilyn Pettit, New York University and the City: An Illustrated History, 1831-1996. New Brunswick, NJ: Rutgers University Press, 1997. Luther S. Harris, Around Washington Square: An Illustrated History of Greenwich Village. Baltimore, MD: Johns Hopkins University Press, 2003. Habegger, Alfred. “James, Henry.” American National Biography Online. February 2000. Accessed September 22, 2015. Available online at http://www.anb.org/articles/16/16-00842.html. Henry James, The American Scene. London: Chapman and Hall, Ltd, 1907. Accessed November 9, 2015. Available online at https://archive.org/details/americanscene00jameuoft. “Henry James, Birthplace, Location of.” Biographical Files; New York University Archives, New York University Libraries. Administrative Papers of the Chancellor Henry Mitchell MacCracken 1884-1910; RG 3.0.3; Box 16; New York University Archives, New York University Libraries. 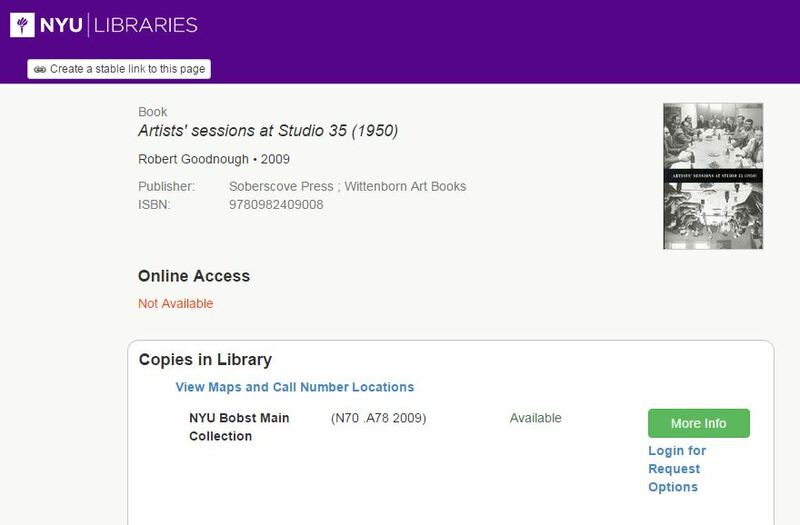 Records of the Office of the Treasurer, 1910-1963; RG 10.9, Box 47; New York University Archives, New York University Libraries. Cornell University ILR School, “Remembering the 1911 Triangle Factory Fire.” 2011. Accessed November 9, 2015. Available online at http://trianglefire.ilr.cornell.edu/index.html. Triangle Shirtwaist Factory National Register of Historic Places Registration Form. Revised August 1986. Accessed November 9, 2015. Available online at http://focus.nps.gov/pdfhost/docs/NHLS/Text/91002050.pdf.